4. Kitsilano Beach/Pool. I go here seriously almost everyday during my runs and it never gets old! There is a great restaurant called the Boathouse and a basketball court and volleyball nets too! 5. Gastown! Arguably the best restaurants in Vancouver are located in Gastown and there are some great coffee shops too! If you're visiting Vancouver definitely go there. It's always full of tourists and super busy!! 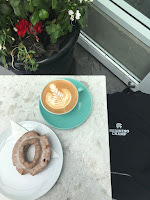 This was my coffee and donut from Parallel 49th mentioned above too! !